U.S. President Donald Trump says immigrant activists and Hispanics will turn against opposition Democratic lawmakers who have supported them and will "start falling in love" with him and other Republicans. Trump said in a Twitter comment that Democrats "are doing nothing" for the estimated 690,000 immigrants who were brought into the U.S. illegally by their parents and are "just interested in politics" in trying to prevent their deportation. Many of the young immigrants, often called Dreamers, have only known the United States as their home. They were temporarily protected from deportation under a program started by former President Barack Obama, but Trump ended it in September, while giving Congress until March to address the issue. The U.S. leader said those supporting the Deferred Action for Childhood Arrivals (DACA) program and Hispanics "will go hard against" Democratic lawmakers and increase their support for him and other Republicans. "We are about RESULTS," Trump said. 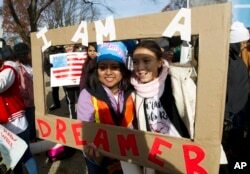 FILE - Demonstrators Karina Velasco, left, and Gabi Sanchez hold a sign during an immigration rally in support of the Deferred Action for Childhood Arrivals (DACA), and Temporary Protected Status (TPS), programs, on Capitol Hill in Washington, Dec. 6, 2017. While Congress could wait until closer to March to decide the fate of the young immigrants, most of whom have attended U.S. schools or hold jobs in the United States, the issue is likely to be a focal point of discussions in the next two weeks. The White House and congressional leaders are negotiating spending levels for the government through the end of September, while also sparring over several contentious government policies, including immigration, electronic surveillance of suspected terrorists and health insurance. Current government funding runs out January 19 and some Democratic lawmakers say they will not vote for a new funding agreement unless the young immigrants are protected from deportation. Trump, even though he conditionally ended the Obama-era program, has at times voiced sympathy for the plight of the young immigrants even as Republican immigration hardliners want them returned to the countries of their birth, mostly Mexico and Central American countries. Trump, in exchange for agreeing to protect the immigrants from the threat of deportation, is calling for approval of stricter immigration policies, including construction of a wall along the southern U.S. border with Mexico, a key campaign plank in his successful 2016 presidential bid. Democratic lawmakers, along with some Republicans, are opposed to construction of the wall, which Trump argues is needed to thwart more illegal immigration. Some Democratic lawmakers have said they are willing to support more border security, but not construction of the wall. Congressional leaders are to meet Wednesday with Trump about several key issues, including protecting the young immigrants from deportation. One Illinois congressman, Democrat Mike Quigley, rebuffed Trump's claim that Democrats have not supported them. Quigley said that allowing the Dreamers "to stay in the only home they've ever known will help America grow and thrive, and Republicans must join us in protecting these young people."